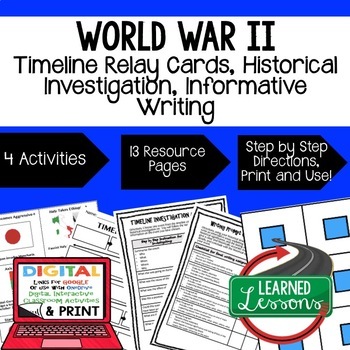 This is an excellent packet to review major events during World War II. This is a good overview to introduce a unit, to review for a major exam, as a project for the unit. Students will be required to sequence events, conduct historical research, and write an informative essay. This is also a great activity for an ELA teacher to practice informative writing and support the social studies classroom. 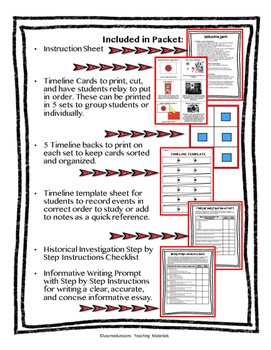 -18 Timeline Cards to print, cut, and have students relay to put in order. 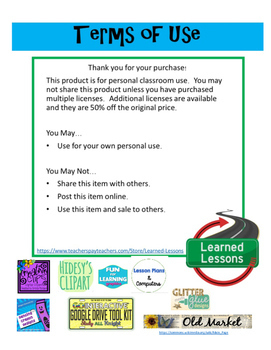 These can be printed in 5 sets to group students or individually. -5 Timeline backs to print on each set to keep cards sorted and organized. 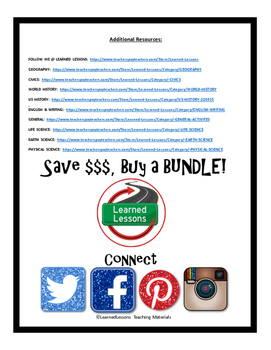 -Timeline template sheet for students to record events in correct order to study or add to notes as a quick reference. -Informative Writing Prompt with Step by Step Instructions for writing a clear, accurate, and concise informative essay.